Yes, this was a bold move and youtubeInMp3.com is now answering under ConvertMp3.io. This was a bold move, considering youtubeInMP3’s kicking popularity. Probably with intention to make this look like a more legitimate startup LOL =) in any case, the new site looks exactly the same, except site name is a bit different. ConvertMP3.com (ex YoutubeInMp3.com) is a service i just came across today and decided to write my review on very fresh usage.. It’ll be another short one. 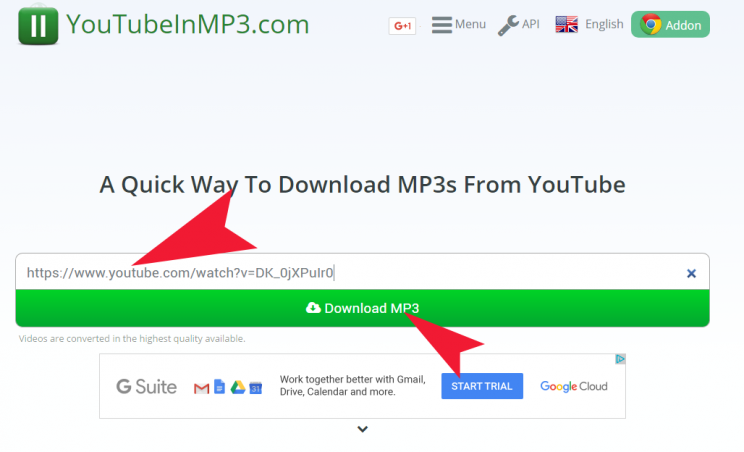 This site only does Video work as to mp3 converter, it doesn’t do anything with the video, and it provides audio as is with low bitrate, if that is the case. Which is understandable, and honorable. but that’s is for my praise to this site. I didn’t really like it and of course annoying ads took over my experience, which warranted the 3 star rating.. Ok, let’s get to it. With the 2 red arrows I’ve indicated the 2 spots we’re interested in. 1st we take the video URL and put it into the box above the green button. 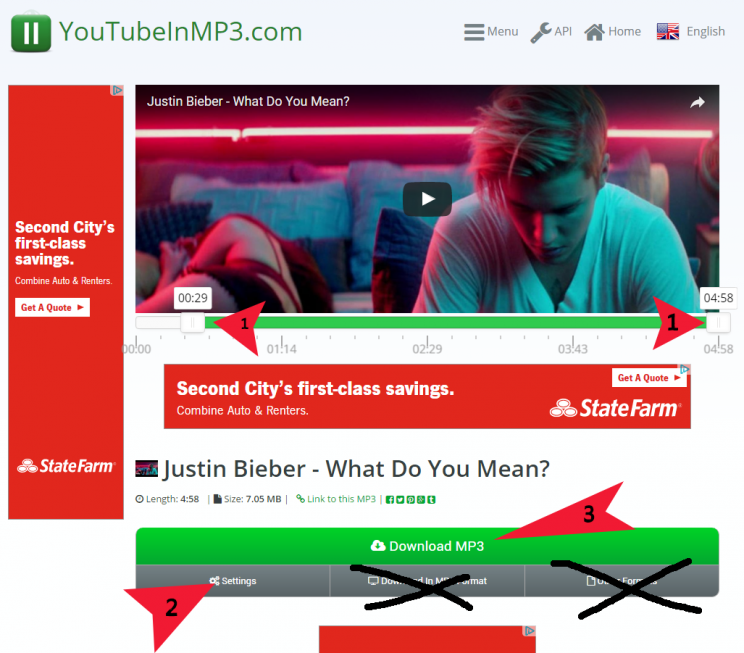 2nd we click that huge green button saying “Download MP3”. and here is what happens.. what happens.. pop-ups happen.. more of this later.. But for now, we see new screen that offers several optional mouse clicks. I’ve indicated those with 4 red arrows, 2 of them deal with step 1, and 2 more below. We will discuss those further down the article. And now we discuss those arrows. =) LOL. did you think i had more to say there? not really.. So now we have an option to actually cut out a piece of the music, maybe useful for those who wants to make themselves nice ringtone.. They don’t want all 4 minutes of the song, maybe just the refrain part or the cool beat.. so there you go, in case just a part of the mp3 is needed, one can use this service to easily cut just a chunk of the mp3 before downloading it. This is indicated by step 1 and the two arrows that have number 1 on them. This step is optional. Also please note the 2 buttons I’ve crossed out. Those redirect you to 2 other sites, which i will discuss in separate articles. Step 2 is also not a must. If you click Settings button, it will allow to set start and end of the rip, as in step 1 (apparently step 1 is visual while step 2 is manual… i guess..). There you can also enter ID3 tags that you would like inserted into the mp3, as well as change its title. Why? Some people like to know what is playing in their media player, and sometimes those players only display ID tags, not the filename or anything related to the actual artist and song name. Step 3. This is where the pain begins.. Depending on your browser and ad-blocker presence, this step can be very annoying… This is what actually makes people enable the ad-blockers in their browsers. Therefore it later affects ALL. From honest tiny bloggers to huge organizations like newspapers and online magazines, that depend on this ad revenue to keep their services going..
That is why there’s the Coalition for Better Ads and google and other browsers are going to work with it and try to sanction sites that display nasty ads, which is good. But it can also affect those who have normal proper ads from google and other “OK” advertisers. we all know how annoying loud sound ads can be, how they sometimes overtake browser and stuff.. well… hopefully soon we see less of those.. Anyway, click the Green DOWNLOAD MP3 button and enjoy the music on your desktop, tablet or smartphone. Yes, this service is online, so it will work on any platform, on any device that has an internet browser.